There are many ways to support our mission to help every child reach their full potential. One year commitment, 4 hours per month and you can change a child's life for the better, forever. We have different types of programs that may work better with your schedule. Big Brothers Big Sisters of the Big Bend is in constant need of male mentors. Our waiting list is filled with boys that need a male role model. While girls and boys across the Big Bend are waiting to be matched, there are hundreds of boys in particular who are ready and waiting to be matched with Big Brothers right now ... that's more than double the number of girls waiting for a Big Sister. You can also make a donation to help fund the careful one-to-one matching and ongoing professional mentoring support unique to Big Brothers Big Sisters. Your gift will help match a child with an adult mentor. The gift you make today will lead to successful outcomes for that child and his or her community. Help us match more at risk kids in the Big Bend area by donating online today! You can also become a Champion for Littles and start a small monthly giving donation that will help support matches throughout the year. Your used clothing, bedding and housewares can help Big Brothers Big Sisters match more at risk children with caring adult mentors. 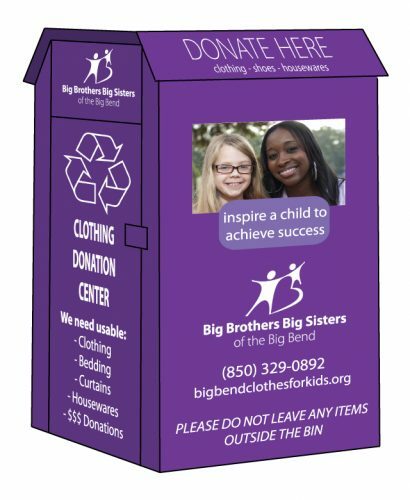 We have Big Purple Bins located throughout Tallahassee and a few in Wakulla and Gadsden Counties. Hopefully you can find one close to you! Your generous donations allow us to help children achieve their potential while also adding local jobs to the economy. Bowl For Kids’ Sake is our largest fundraiser each year. Help raise money to match more at risk kids and celebrate with a bowling party at FSU’s Crenshaw Lanes. The Big Bash is a fundraising and a friend-raising event for Big Brothers Big Sisters. This is the Tallahassee champagne event of the summer. One you won’t want to miss!